wever, fortifications were built. As tension heightened in spring 1941, Stalin was desperate not to give Hitler any provocation that could be used as an excuse for an attack; this caused him to refuse to allow the military to go onto the alert even as German troops gathered on the borders and German reconnaissance planes overflew installations. This refusal to take the necessary action was instrumental in the destruction of major portions of the Red Air Force, lined up on its airfields, in the first days of the war. Stalin's insistence on repeated counterattacks without adequate preparation led to the loss of almost the whole of the Red Army's tank corps in 1941 – many tanks simply ran out of fuel on their way to the battlefield through faulty planning or ignorance of the location of fuel dumps. While some regard this offensive strategy as an argument for Soviet aggressive strategic plans, the offensive operational planning was not, by itself, evidence of any aggressive foreign policy intent. 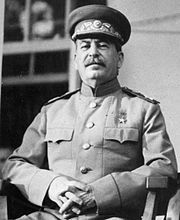 Unlike Hitler, Stalin was able to learn lessons and improve his conduct of the war. He gradually came to realise the dangers of inadequate preparation and built up a competent command and control organization – the Stavka. Incompetent commanders were gradually but ruthlessly weeded out. At the crisis of the war, in autumn 1942, Stalin made many concessions to the army: unitary command was restored by removing the Commissars from the chain of command. After the Battle of Stalingrad, shoulderboards were introduced for all ranks; this was a significant symbolic step, since they had been seen as a symbol of the old regime after the Russian Revolution of 1917. Beginning in autumn 1941, units that had proved themselves by superior performance in combat were given the traditional "Guards" title. But these concessions were combined with ruthless discipline: Order No. 227, issued on 28 July 1942, threatened commanders who retreated without orders with punishment by court-martial. Infractions by military and politruks were punished with transferral to penal battalions and penal companies, and the NKVD's barrier troops would shoot soldiers who fled.